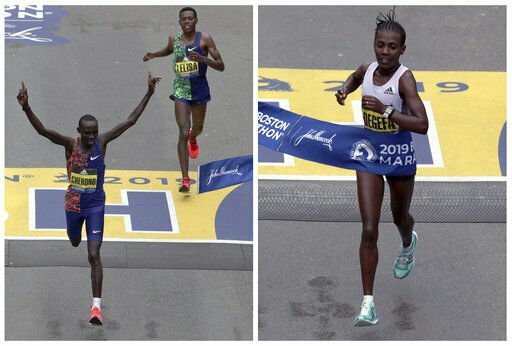 In this photo combo, Lawrence Cherono, left, of Kenya, breaks the tape in front of Lelisa Desisa, of Ethiopia, to win the men's division, and Worknesh Degefa, right, of Ethiopia, breaks the tape to win the women's division of the 123rd Boston Marathon, on Monday in Boston. 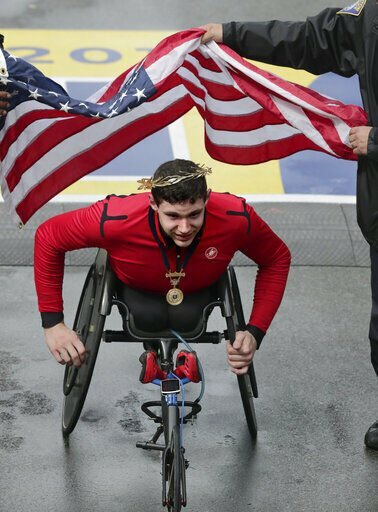 Daniel Romanchuk, of Urbana, Ill., wears the victor's wreath after winning the men's handcycle division of the 123rd Boston Marathon on Monday in Boston. Lawrence Cherono, of Kenya, holds the trophy after winning the 123rd Boston Marathon, on Monday in Boston.